Live from Britannica’s historic Chicago headquarters, Young Chicago Authors delivers an explosive lesson in slam to local educators. 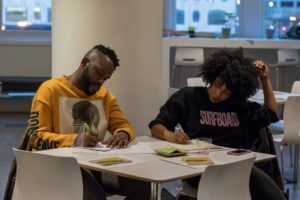 On the evening of April 19, 2018, educators, youth mentors, and aspiring teachers from around Chicago trickled into Britannica HQ for an intimate evening of conversation and poetry. The powerful workshop, led by YCA, aimed to teach educators how to nurture the voice of each student via the modern art of performance poetry. In other words, to show them ways to Pass The Mic. The workshop, Pass The Mic, stemmed from our community’s call to amplify the voices of young folks and give educators creative tools to support that. It was also an event about giving teachers the kinds of resources that students really connect with, that strike a chord and make learning exciting. When we were planning Pass The Mic, we got really excited about performance poetry for its ability to not only center student voices, but also to deepen literacy in such a relevant way. To explore slam poets and hip hop lyricists is to discover master storytellers, linguists with vast vocabularies, thoughtful analogies, and legendary metaphors. They are able to weigh in on social issues, advocate for change, and connect young folks with new topics and knowledge in ways that inspire them to keep seeking. At Britannica we’re excited to partner with organizations, like Young Chicago Authors, who have transformative relationships with a community that we share, who approach challenges in thoughtful ways, and who create powerful experiences that resonate. We’re excited to continue bringing new knowledge and creative programs to our community. While riding high on empanada-induced endorphins, attendees were treated to the even meatier delight of slam poetry at its most refined with a performance from two members of YCA’s “Bomb Squad” of elite poets, Mahoor Jamal and Ken Muñoz. The room was still digesting all of the above when something was made as clear as our lobby doors: you were here to work. One innovative ice-breaker circuit later, and the night’s emcee José Olivarez was pacing between the hushed tables of our cafeteria chiming “I don’t believe you” at the bowed heads of a couple dozen furiously scribbling adults. One of many innovative writing drills YCA employs, I Don’t Believe You blends structured free writing with prompts typically used in improv sessions. More than an hour of hands-on composition exercises followed as Olivarez put educators through the paces of YCA’s unique learn-by-doing lesson plan. What transpired was a one-of-a-kind evening of experiences that the attendees—a diverse pool of educators from teachers and future teachers to community organizers and outreach specialists—could transpose directly into their work with youth. To get a taste of the night’s curriculum, check out the resources linked below and don’t miss the Bomb Squad performances we captured on Facebook Live. Drop a bomb on the traditional poetry lesson with classroom resources straight from the pros at Young Chicago Authors. Get in the rhyming groove with our intro to hip hop playlist!